I believe that teaching our children about sustainability is one of the most precious gifts we can ever give them. My son is 3 years old, a huge helper and an eager learner, which makes teaching him about caring and loving the earth a blast. The first responsibility my son ever had was to help take the recyclable items out to the recycle bin. From the time it takes to walk from the kitchen to the recycle bin outside we talk about what the items could be turned into and how we are helping the earth by re-using. I love it, he loves it - how perfect is that?? Another way I teach him about sustainability in the kitchen is by using fresh produce from our home garden. One major perk of growing your own produce is that there is no packaging. Recycling is good, but no waste is even better! Since he is now 3 years old and is able to understand about plants growing we figured it was time to let him start his own garden. 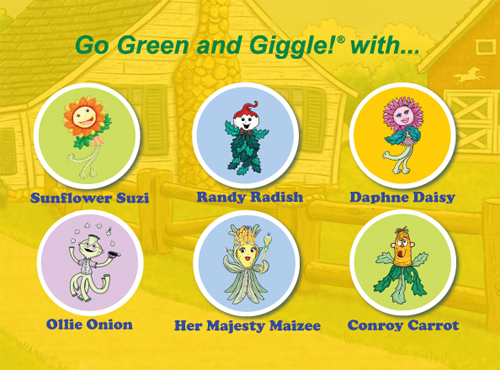 We found this fun site, Gigglin' Garden Gang. There is content for both kids and parents, along with videos and music - which my son LOVED! 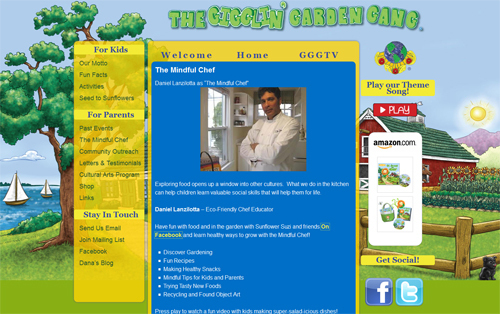 Also on the Gigglin' Garden Gang site is The Mindful Chef, Daniel Lanzilotta, who is an Eco-Friendly Chef Educator. If you check out their facebook page he shares fun recipes, making healthy snacks and help on getting your kiddos to try tasty new foods. 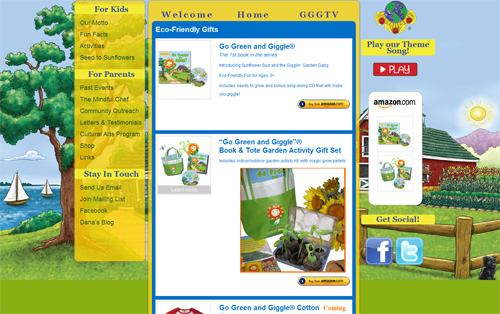 The Gigglin' Garden Gang website also has a few items you can purchase to help get your kids interested in gardening.We chose the "Go Green and Giggle" Book & Tote Garden Activity Gift Set. 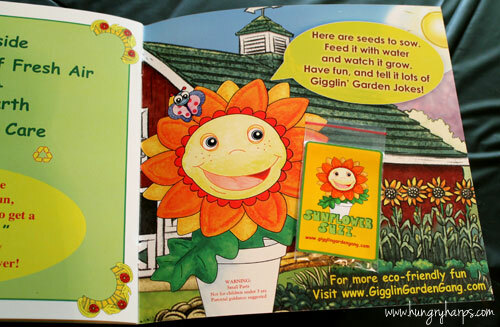 The kit includes a book, cd, magic growing pellets, sunflower seeds and a tote. Very cute! The kids opened the box and immediately started checking everything out. I love that the box was packaged so that when it is opened it looks like a gift. So great! 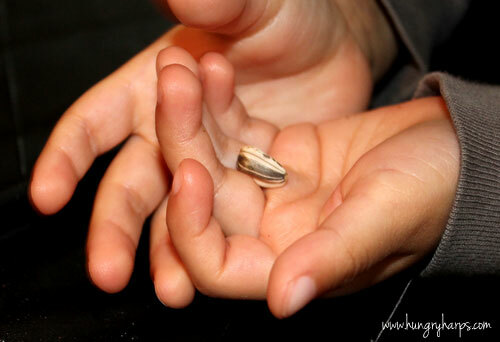 It was our sunflower seeds to plant, what an awesome way to end the book!! The kit comes with a little greenhouse that will fit 6 plants - so each kid was able to plant 2 seeds. 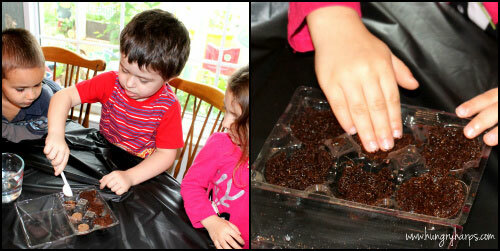 They were so good with it and so excited to be gardening - even if it was on the dining room table. We talked about what plants needed to grow and which foods we eat that come from gardens. It was a great time! If you want to check out more about the Gigglin' Garden Gang you can go to their site, here or check them out on facebook or twitter. Good day! This shop has been compensated as part of a social shopper insights study for Collective Bias. #CBias. What an awesome kit and a super lesson for your son AND his friends. So fun! Ah! Looks like they had fun! 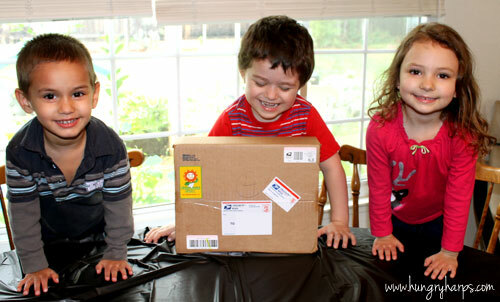 Love that they were giggling even before opening the box! :) Too cute!